For as long as I can remember, I’ve always wanted to go to law school. I’ve always been interested in history, law, and the judicial system. But it was not until joining YIG that I discovered my passion and what I hope to do with the rest of my life. The first time I heard about Youth in Government was in 8th grade. My brothers had just returned from their first conference and could hardly take turns to tell me everything they had experienced. The first thing they said was, “Oh my gosh, Paige. You are going to love YIG.” Looking back three years ago, I could have never imagined how much I would truly love this program and the impact it would have on my life. My first YIG conference was amazing. I was introduced to a legislative process that I instantly fell in love with. I observed how it enabled every person to make their voice heard, while still maintaining efficiency and respect. 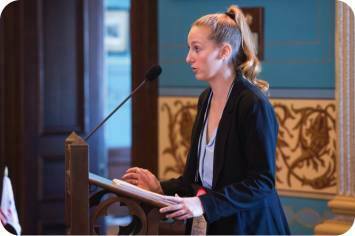 Nervously, I forced myself to go outside of my comfort zone and speak in Senate the first time. I met amazing friends, learned so much from those around me, and was exposed to new perspectives. The next year, I could hardly wait to return. I patiently anticipated my favorite part of the year. When it finally came, I cherished the opportunity even more. I prepared and jumped into debate far more than the previous year. At the end of the conference, I unexpectedly ended up receiving an award. Following the conference, those around me continued to encourage me to pursue a larger role in the program. Over the course of that year, I became increasingly interested in politics and public speaking. It quickly became my biggest passion, until there was nothing that interested me more. Eventually, I decided to run for Youth Governor with the hope of playing a bigger role in this wonderful program. Youth in Government has taught me so much, and having the opportunity to continue learning from those around me as I serve as the 2020 Early Conference Youth Governor is truly an honor. YIG has shown me that being a leader is being able to recognize where your strengths end and where others’ begin. It has taught me that in every situation, I am presented with the opportunity to gain something from those far more knowledgeable than myself. It has shown me that the best solutions are reached when we graciously pursue compromise amidst our disagreements. Most importantly, YIG and all its delegates have taught me that prioritizing respect and embracing our differences allows for the most cohesive government, society, and relationships. I am so grateful for this opportunity. Thank you so much to everyone in YIG for allowing me this position. Thank you for the friendships and all of the fun that comes with being part of this organization with each of you. Over the course of this year, I will continuously strive to fulfill the hopes I expressed for this program during my campaign. Above all else, I hope to see all of us, as the next generation of leaders, continue to carry an unprecedented respect and civility into every aspect of our lives.